File this under: I have a chicken and some onions and need to have dinner on the table in 38 minutes. I adapted this from an old Gourmet recipe and one of the things I changed was to triple the amount of onions because they are the best part of this dish. Seriously, a delicious from-scratch dinner does not get easier than this. 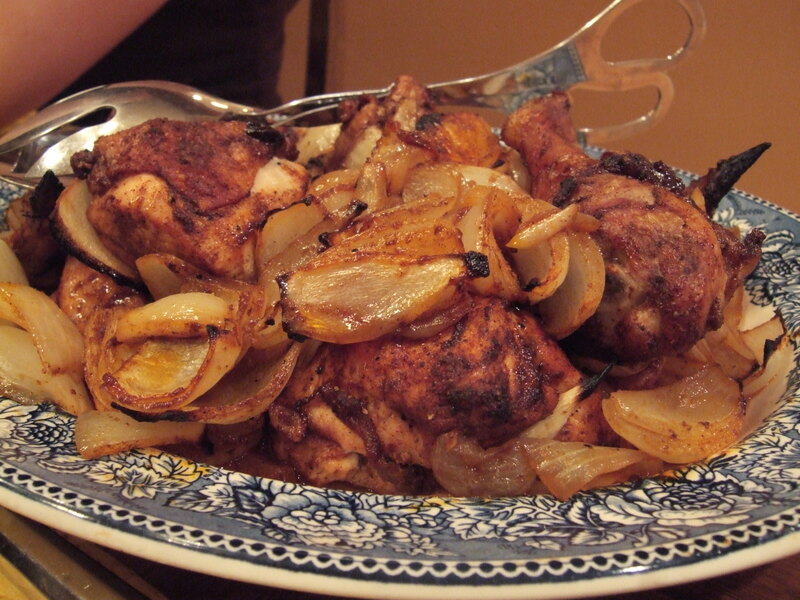 Place chicken and onions in large bowl, sprinkle with spices and drizzle with olive oil. Mix with a rubber spatula until the chicken and onions are evenly covered with oil and spices. Turn out onto a cookie sheet and cook for 30 minutes, or until chicken is golden brown. Serve. I LOVE paprika; there is always bright red, glorious, fragrant Hungarian paprika in my freezer. I get it at the Hungarian Meat Market at 81st Street and Second Avenue. It’s the last hold-out Hungarian store in the neighborhood that once housed most of the Hungarian immigrants in NYC. Last week I bought sausage there to make lesco, using the beautiful tomatoes I put up in September, and I make Gizi’s Chicken Paprikash all the time. This looks delish – almost like tandoori chicken! I am definitely trying it, but I will use who legs as I prefer dark meat. Victoria, you are going to have to take me on your own culinary tour of NYC when I’m there next. This will be amazing with good paprika. I often stop by the Spice House for the good stuff but this time just used fresh supermarket brand. I am also a dark meat person but married to a breast man (fortunately, only in the chicken sense). So we divide up a chicken quite nicely! This looks great. I have made something similar before. I might make this for dinner tonight.